Many schools in Bangkok were closed today and others were dismissed early for fear that the verdict given by the Constitution Tribunal would result in unrest. All Thai network channels televised the reading of the verdict which dissolved the dominant Thai Rak Thai Party, lead by ex-primer Thaksin Shinawatra. The verdict also banned Thaksin and 110 top Thai Rak Thai members from political life for five years. The judges felt that the crimes committed by the Thai Rak Thai party are dangerous to democracy. Two party members were found guilty of hiring small parties in the April 2006 election to run against Thai Rak Thai nominees. Some are afraid that the ban of leading political figures will create a negative climate for the country’s political future. The verdict place the majority of the blame for the Thai Rak Thai unscrupulous political dealings on the founder and former-leader Thaksin Shinawatra. The judges felt that Thaksin had used the party for his own personal interest. It is unclear what will happen to the Thai Rak Thai party in the immediate future. The scare that violence might erupt after the verdict was announced was unfounded after all . Only a few peaceful protesters gathered in three locations in Bangkok and the security force was not needed at all. The latest violence in southern Thailand occurred in Hat Yai’s commercial center last night. The bombs went off at two hotels, two pharmacies, a department store and a restaurant. It is reported that at least 13 people were injured. A few of the bombs were positioned on unattended motorcycles and set off using a timer or cell phone. Recent attacks have demonstrated that the separatist is the Muslim-dominated south are seeking more attention, although the police chief of Songkhla province said the bombs may be the related to national politics. The southern violence has becoming increasingly organized and are occurring more frequently. The provinces under greatest threat of violence are the provinces of Pattani, Yala and Narathiwat. Hat Yai is a popular location for Malaysians, Singaporeans and Indonesians to spend their weekends and holidays. These bombings are expected to have a large effect on local tourism. The six bombs were positions in the area of Thammanoonwithi Road, which is a major area for tourists and night entertainment. A few of those killed and injured in the explosions were foreigners. This bombing is reminiscent of the September 2006 bombings when six homemade bombs exploded in Hat Yai. In that incident, four people were killed including one Westerner. The police reports that these bombings are no where near as extensive as the September 2006 bombings. If you have time during a visit to the Bridge over the River Kwai, take the train from the bridge to the last station to get to the Sai Yok Noi waterfall. Nam Tok station is the end of the infamous “Death Railway” that linked Thailand and Burma in World War II. The station offers easy access to Sai Yok Noi waterfall, which is only 2 km away. On the way you’ll experience travel by train through Thailand’s countryside. You can stop at other well-known sightseeing locations that are easily accessible via rail as well. At one point the train goes along a mountain and curves sharply so that people at the front of the train can see those in the back of the train. The train travels slowly but it’s a change of pace from the normal automobile transportation. Nam Tok Sai Yok Noi means “small waterfall.” Nam Tok Sai Yok Noi is a great stop on the way to Sangkhla and the Three Pagodas Pass or on a daytrip other sights in Kanchanburi. 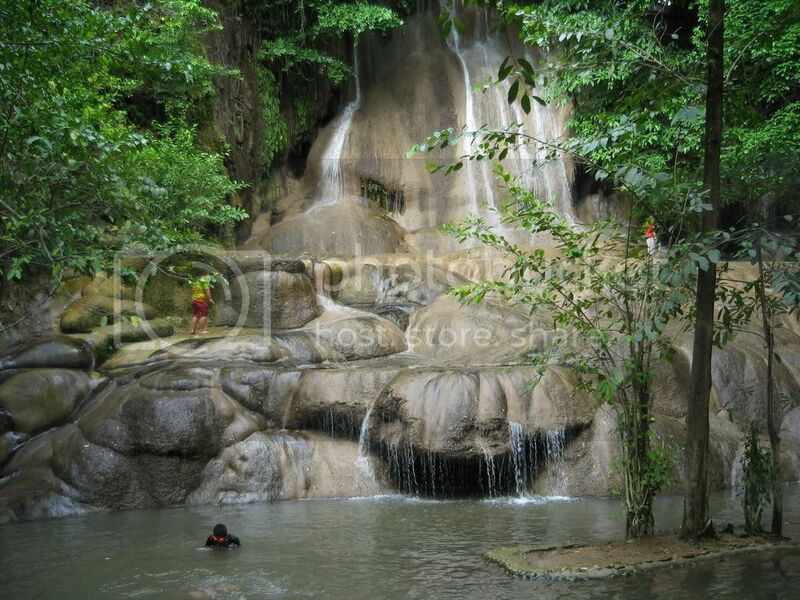 There is a classic Thai song that speaks of the beauty of the Sai Yok Falls. The Sai Yok waterfalls, Yai and Noi, are in Sai Yok National Park. There is an admission fee to get into National Park, but I’ve never seen a ranger booth at Nam Tok Sai Yok Noi. I’ve visited twice with foreigners and never paid, so it doesn’t appear that the fee is collected there. If you are going by car, the Nam Tok Sai Yok Noi falls are 77 km from Kanchanaburi on Highway 323 en-route to Sangkhla and the Thai-Burmese border. A special feature of Nam Tok Sai Yok Noi is the way the way rolls slowly down the limestone. 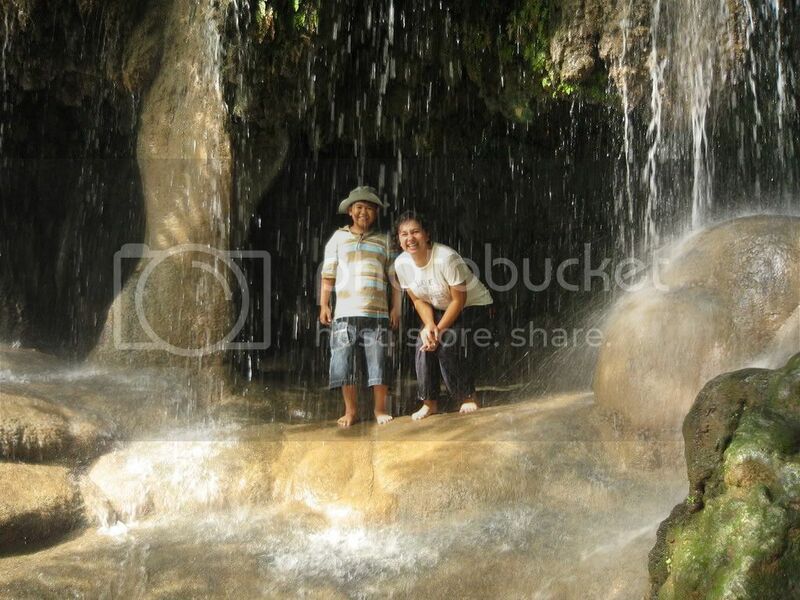 You’ll see people walking in the waterfall with water splash around their feet. 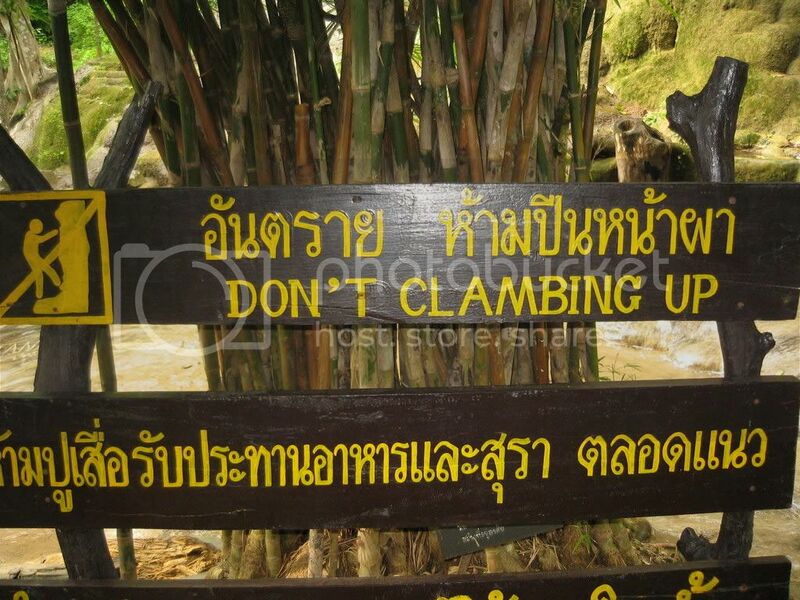 The sign doesn’t specify that you can’t “walk” on the waterfall. At first I was hesitant and afraid of slipping on the rocks, but I found that it was very easy to walk on the rocks. The footing was actually good, just don’t step on green algae that grows in some spots. It’s a thrilling sensation to be walking all over this lovely waterfall. There’s a small cave near the top of the falls where you can see some stalagtite and stalagmite formation if you don’t mind getting wet. Children often swim in the bottom of the falls wearing inner tubes. The best time to visit is in the rainy season when there is plenty of water and the falls are at their most glomorous. However, even in the dry season there is enough water to splash around in and cool you off in the hottest time of the year. The first time I visited Nam Tok Sai Yok Noi was in November and the falls were packed with Thai visitors. The water filled the lower portion of the falls as well and it was hard to walk anywhere without wading in water. I recently visited in May and the main falls were still there, but the lower portion was dried up. It was a great end to a day in Kanchanaburi and everyone left a little wet. Across the street from the falls are a row of vendors. There’s even a 7-11 for refreshments. Mostly of the stores are selling banana chips. The vendors will let you taste the different flavors of banana chips. We grabbed a few bags and munched on them while we drove back to Bangkok. Bill Gates to build man-made island? Currently, Thailand is named Asia’s premier destination for marine tourism and marinas. The exisiting Royal Phuket Marina does not suffice for the large yachts since the low tide beaches those large vessels. The proposed man-made island would solve that problem for the super rich yacht lovers. It would also boost high end travel since it attracts tourists with money to spend on luxuries such as yachts and exclusive tropical island homes. Thai officials from the Tourism Authority of Thailand are enthusiastic about these reports as they see the project as beneficial for Thailand’s image and it’s tourism industry. TAT sees Gates’interest as a result of effective campaigning to draw tourists back after the tsunami. Those concerned about environmental issues say that the effects of creating a man-made island in Phang Nga Bay have to be evaluated before undertaking the project. The unique ecosystems in the area is already damaged by mass tourism in the area who want to enjoy the natural beauty of the limestone islands, coral reefs and marine wildlife. A balance of commercial and environmental interests should be reach to preserve the landscape that lures tourists to Thailand in the first place. The marina is in the early planning stages and has not been approved yet. Many details need to be worked out as to exact location, provincial jurisdiction and the overall feasibility of the man-made island. A press conference will by held at Royal Phuket marina on May 25 to announce the current plans. The Hua Hin Jazz Festival will be on June 8th and 9th 2007. This is the 6th annual event sponsored by Heineken and the Hilton. The Jazz Fest is located near the main beach strip off of the road that leads to the railway station. The Jazz Festival draws visitors to Hua Hin to listen to jazz artists and bands while enjoying food and drink. Last year Hua Hin hotels welcomed thousads of Thai and foreign visitors alike who flooded into town for three or four days. Many visitors also stayed at the nearby town of Cha-am. Already a town with little nightlife, Cha-am becomes deserted on the evenings when the Jazz Festival is on. The atmosphere is relaxed and many end up sitting on beach mats or directly on the sand. There is a variety of food stalls sponsored by the area’s hotels and restaurants offering local foods. Some booths offer product sales or freebie items. The Heineken booths are very popular for souvenirs and Heineken products. Some items sell out the first night so get there early if you want to shop. The Honda Jazz booth displaying the car that bears the same name as the music featured at the festival is worth a stop as well. In comparison to last year, the Jazz Festival is a smaller event. There are only two nights this year, Friday and Saturday, whereas in 2006 the Fest lasted three nights. Another downsize this year is only having one stage. The performances start nightly from around 5 o’clock until 1 am. The event is free of charge and people start arriving in droves as soon as it gets nice and dark. If you want to have a place near a stage, arrive earlier to save your spot. Come an enjoy a weekend full of beautiful scenery and music at the Hua Hin Jazz Festival 2007. **Dates, times and performances are subject to change. This market is an interesting place to stop by on a Saturday night if you like shopping for second hand items. You’ll hardly see a foreigner and the place is crawling with young Thais who have a soft spot for the vintage scene. Among some of the items you’ll find in the night market are shoes, jeans, clothes, antiques, furniture, decor items and knick-knacks. While the majority of the items are used, you can find new items in among the different stalls. The atmosphere is hip and trendy with a little bit for everyone. It’s not an organized place but that’s part of the fun. You’ll come across random items in each store and there’s plenty to look at. The highlight of the market are the vintage motorcycles and cars. Lovers of Volkswagen buses and Beetles, Mini Coopers, Vespas and Yamahas are in for a treat. Before heading home you can grab a snack or a drink, even cocktails and whiskey are available. The main food area is located near Ladprao road but food carts are dispersed throughout the market. A shortage of proper lighting in the market which makes parking and shopping a chore. Bring a flashlight to inspect items carefully as some stores offer little light. Most of the items will be one of a kind and used so check for damage before making a purchase. If your item happens to be flawed in some way, use it as an extra bargaining chip. When: Saturday night from 19:00-23:30 Get there early to park or you’ll be waiting for a spot. Where: At the Ratchada-Ladprao junction on the grounds of the former Ratchada Night Plaza. Located in the parking lot of the MRT Ratchadapisek parking lot. How to get there/Where to park: The easiest way to get there is to take the MRT to Ratchadapisek station. by car, if you are on Ratchadapisek Road going towards Viphavadi, turn left into the MRT parking lot. It is poorly lighted so keep an eye out as you approach the junction. When you go to Rasayana Retreat for the first time, you might be undecided about whether or now you want to go through the cleansing process. They have orientations available for people interested in learning more about the process and other treatments they offer.The day that I went to Rasayana, there were five people in the orientation. The representative from Rasayana could speak Thai and English. She went through the cleansing process in detail. First, everyone who does a cleans must go through the 7 day cleansing and are recommended to spend a few days in a precleanse. A precleanse (step one) helps your body to adjust from your normal dietary habits to the foods that you will eat during the cleanse. Some people will only do the 7 day cleanse (step two), while others will do 2-3 week cleanses (step three and four). Each step reduces the amount of solid and alkaline foods that you consume which makes it easier for your body to detoxify itself. Second, the cleanse consists of increased consumption of alkaline foods, elimination of acidic foods and artificial sodium, eating herbal supplements and ‘scrubbing’ shakes. This will be the most difficult part of cleanse for most people as it requires a lot of willpower to eat only fruits and vegetables, take 6 herbal pills 5 times daily and drink a Clay/Fiber Shake 3-5 times daily. The packet that they distribute once you start the course explains in detail the foods you should and shouldn’t eat, the different pills and supplements that you will be eating and the schedule for each event in the detox process. Third, the cleanse process involves regular colonics on Day 1, 3, 5, and 7 of each week. Many people are hesitant about having colonic irrigation and it is an embarrassing topic. The staff at Rasayana Retreat are very professional and try to make you feel as comfortable as possible. It is alot like going to the doctor’s office in a spa environment. You are given you own treatment room with ensuite bathroom. They give you a hospital gown to change into. In the treatment room, the technician will instruct you throughout the process so that you will know what to expect. If you feel uncomfortable with the technician being in the room while you evacuate your system, they will leave you alone. The process is most effective when you relax and become more comfortable. Afterwards you can enjoy a shower before changing back into your street clothes. Step One – Two shakes daily, one first thing in the morning and one in the afternoon. You can eat breakfast, lunch and dinner. 6 herbal pills takes 1.5 hours after the consumption of solid/alkaline foods (each meal). Step Two – This is where you start the routine of shake/herb/shake/herb. No breakfast at all in this step, but you can mix fruit or vegetable juice into your shakes instead of plain water. In the morning it is shake, herb, shake, herb every 1.5 hours. At lunch you can eat fruits and/or vegetables seasoned anyway you like but twith no salt. Rasayana Retreat recommends different herbs, pepper and raw honey. 1.5 hours after lunch do another set of herb, shake, herb and another meal of fruits andor vegetables for dinner. Follow the meal with another batch of herbal pills in 1.5 hours and then at bedtime beneficial bacterial pill Flora Grow. Step Three – Same as Step Two except that dinner is replaced by a shake. The solid/alkaline food is limited to one meal a day. Step Four – Same as Step Two except that lunch and dinner are replaced by a shake. At this stage you are consuming the least amount of solid/alkaline foods and your body is at it’s maximum detoxing ability. This concludes the basics about Rasayana Retreat’s detox cleansing process. Anyone interesting in learning more about the detox is encouraged to contact or visit Rasayana Retreat directly as they are the experts. Many people in Bangkok, few people felt the earthquake unless they were in high buildings. The earthquake epicenter is located in Laos and that is why Chiang Rai and Chiang Mai showed the greatest effects. Buildings may have new cracks as a result of this recent quake. Generally, people in high rise building and were on higher floors felt the shaking. The earthquake was shallow as well, while means that the vibrations don’t travel as far. The comments made on the news reports were a bit comical to someone who hails from earthquake country. News footage showed the slow swaying of light fixtures in hotels. The motion seemed to be more rolling than the quick jarring that I associate with more devastating quakes. But, 6.1 on the Richter scale is nothing to laugh at especially when you are in tall concrete buildings. I’d hate to have to evacuate down all those flights of stairs, possibly without emergency lights in the stairwells. Some buildings were evacuated but there are no reports of casualities or major damage caused by the quake. Thailand. One TV station reported that from 2518-2549 there were only 8 earthquakes larger than 5.0 on the Richter scale. That averages out to 1 earthquake every 3-4 years. It never hurts to be prepared and think about what to do in the event of an earthquake. Make sure you find a sturdy table or doorway for cover. Have extra drinking water on hand in case the earthquake causes a disruption in the water supply or water contamination. Think about the best way to evacuate the building after the shaking stops. So now when I think that my bedroom’s shaking, I’ll have to figure out if it’s an earthquake or a ten wheeler driving by my house. As I was making my way through the maze of small streets that I use to get from my house to work, there was a unusual backup in the soi. The soi, like most sois in Bangkok, is small and two cars can barely pass while dodging fences, plant pots, telephone poles and pot holes. Normally traffic flows through okay, but this morning the cars on both sides were at a stand still. At first the cause of this congestion was unknown because only a mass of cars were visible. Slowly, the cars on the other side of the street inched forward and revealed a small herd of cows walking down the middle of the street. Most of the cows were walking together on the opposite side of the street from me. It was as if the cars had been replaced with cows. A few cows were seperated from the main group and walked towards cars head on or stood on the side of the soi looking confused. Walking behind the crowd was a mother cow proding her calf from behind. All of the drivers tried their best to weave around the cows very slowly. The animals didn’t startle and merely went along at their leisure. The sight was amusing, even though it caused many people to be delayed. Behind my house is a large undeveloped area that is prime habitat for wildlife. Regularly, I sit on my balcony and watch the birds that visit our trees and forage in this patch of wilderness. The rainy season is here and I’ve spent the past few nights listening to a nature soundtrack rendered by another type of animal. The music starts in the evening and it is a constant symphony of croaks, ribbits and chirps. The melody changes are high pitched noised begin and lower pitched noises droan on. Dogs barking and other load noises do little to stop our musician. The music continues uninterrupted for most of the night. This kind of behavior signals the beginning of the mating season. Our frog and toad friends are calling out to find a suitable mate. The females are given clues about a male by his call, like his size and species. The continuous calling will help her seek him out if she thinks he is suitable. The rains have turned many areas into marshy wetland that amphibians desire as hatcheries for their young. Water is where the eggs will be laid and later the tadpoles will live in until they change into their adult forms. Breeding early in the season will ensure that standing water will be around long enough for tadpoles to reach adulthood. The past few nights I have slept soundly and stayed in bed a little longer than usual. Does the amphibian symphony have anything to do with it? The sounds bring nature right into my bedroom. Even while watching TV the croaking can still be heard. The sounds make you feel like you are alone in the wild and far from civilization. It is hard to remember that I am in a huge city like Bangkok. I hope that the little Romeos croaking their little hearts out find their Juliets.